Sloth is the common name for any of the slow-moving, New World arboreal mammals comprising the families Megalonychidae (two-toed sloths) and Bradypodidae (three-toed sloths) of the order Pilosa. There are six extant species. The four living species of Bradypodidae are about the size of a small dog and are characterized by three-clawed digits on their forelimbs and a short tail. The two living species of Megalonychidae are characterized by only two digits on their forefeet, the absence of a tail, and a more prominent snout, and longer fur. Sloths are found in Central and South America. The two-toed sloths are somewhat larger and generally faster moving than the three-toed sloths, but all are noted for their very slow, graceful movements. They also are noted for their almost exclusively arboreal existence, descending to the ground only rarely to urinate and defecate and generally hanging upside-down from branches with their long, curved claws. Sloths provide unique ecological functions. The fur of sloths is a special ecosystem that is home to many insects—sometimes hundreds of beetles—and they have a mutually beneficial symbiotic relationship with algae, providing a habitat for algae while the green color added to the fur helps to camouflage the sloths. 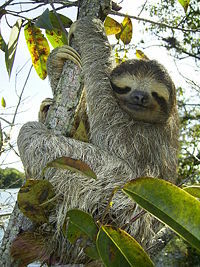 The sloths also provide fertilizer for the trees in which they live and forage. 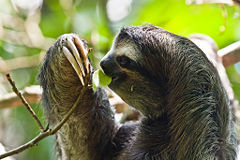 Although unable to survive outside the tropical rainforests of South and Central America, within that environment sloths are outstandingly successful creatures: they can account for as much as half the total energy consumption and two-thirds of the total terrestrial mammalian biomass in some areas. For humans, their gentle nature and unusual behaviors add to the wonder of nature. This article mainly deals with the living tree-dwelling sloths. Until geologically recent times, large ground sloths such as Megatherium (BBC 2008) lived in South America and parts of North America. Ground sloths disappeared soon after humans arrived, suggesting that humans drove ground sloths to extinction (Mason 2005). Of the six living species, only one, the maned three-toed sloth (Bradypus torquatus), has a classification of "endangered" at present. The ongoing destruction of South America's forests, however, may soon prove a threat to other sloth species. Sloths belong to the Pilosa order of mammals. Most scientists call the sloth suborder Folivora, while some call it Phyllophaga. Both names mean "leaf-eaters;" the first is derived from Latin, the second from ancient Greek. Tribal names include Ritto, Rit, and Ridette, mostly forms of the word "sleep," "eat," and "dirty" from Tagaeri tribe of Huaorani. Brown-throated three-toed sloth (Bradypus variegatus), Cahuita National Park, Costa Rica. The living sloths are placed in one of two families, known as the Megalonychidae ("two-toed" sloths) and the Bradypodidae (three-toed sloths), with the former limited to the genus Choloepus and the later to the genus Bradypus. All living sloths have in fact three toes, that is three toes on the hindfeet. However, the "two-toed" sloths have only two fingers, versus three for the three-toed sloths. The living sloths are characterized by short, flat heads, big eyes, a short snout, long legs, and tiny ears. Three-toed sloths are about the size of a small dog, with the head and body having a combined length of around 60 centimeters, and the animal having a weight of 3.5 to 4.5 kilograms (or between 7 and 10 pounds). Unlike the two-toed sloths, they also have a short (6-7 centimeters) tail, and they have three clawed toes on all four of their limbs. The generally larger two-toed sloths have a body length of between 58 and 70 centimeters, and weigh between 4 and 8 kilograms. Other distinguishing features of the two-tailed sloths include a more prominent snout, longer fur, and the absence of a tail. Two-toed sloths are generally faster moving than three-toed sloths. Both types tend to occupy the same forests: in most areas, one species of three-toed sloth and one species of the larger two-toed type will jointly predominate. They are arboreal and sleep, eat, and travel among the trees, moving very slowly and generally hanging upside down. Hoffmann's two-toed sloth, Choloepus hoffmanni. Sloth fur exhibits specialized functions. The outer hairs grow in a direction opposite from that of other mammals. In most mammals, hairs grow toward the extremities, but because sloths spend so much time with their legs above their bodies, their hairs grow away from the extremities in order to provide protection from the elements while the sloth hangs upside down. Sloth fur is also host to algae; this algae colors the coat green and acts as camouflage (Butler 2007; Kissell 2008). Because of this algae, sloth fur is a small ecosystem of its own, hosting many species of non-parasitic insects; one sloth was found to host about 950 beetles (Butler 2007). One species of moth is dependent on the sloth for its life cycle, traveling with the sloth to the ground when the sloth defecates and laying its eggs at that time (Butler 2007). Almost all mammals have seven cervical vertebrae or "neck bones" (including those with very short necks, such as elephants or whales, and those with very long necks, such as giraffes). The two-toed sloths and the three-toed sloths are among the few exceptions. The two-tailed sloths and manatees have only six cervical vertebrae, and three-toed sloths had nine cervical vertebrae (Narita and Kuratani 2005). Sloths have extraordinary adaptations to an arboreal browsing lifestyle. Leaves, their main food source, provide very little energy or nutrition and do not digest easily. As one adaptation, sloths have very large, specialized, slow-acting stomachs with multiple compartments in which symbiotic bacteria break down the tough leaves. As much as two-thirds of a well-fed sloth's body-weight consists of the contents of its stomach, and the digestive process can take a month or more to complete. In addition, sloths deal with the low-energy content of their diet by a range of physiological economy measures: They have very low metabolic rates (less than half of that expected for a creature of their size), and maintain low body temperatures when active (30 to 34 °C or 86 to 93 °F), and still lower temperatures when resting. Sloths move only when necessary and even then very slowly: they have about half as much muscle tissue as other animals of similar weight. They can move at a marginally higher speed if they are in immediate danger from a predator (4.5 meters or 15 feet per minute), but they burn large amounts of energy doing so. Their specialized hands and feet have long, curved claws to allow them to hang upside-down from branches without effort (Mendel 1979, 1981a, 1981b, 1985a, 1985b). While they sometimes sit on top of branches, they usually eat, sleep, and even give birth hanging from limbs. They sometimes remain hanging from branches after death. On the ground, their maximum speed is 0.025 to 0.05 meters per second (about 5 feet per minute), but in the trees they can move at a slightly quicker speed of 0.050 to 0.083 meters per second under normal (not emergency) situations (Weinberg 1999). It had been thought that sloths were among the most somnolent animals, sleeping from 15 to 18 hours each day. This image has been called into question by a study examining the sleep patterns of sloths in nature and revealing that sloths sleep under just ten hours a day (Briggs 2008). They go to the ground to urinate and defecate about once a week. They go to the same spot each time and are vulnerable while doing so. The reason for this risky behavior is unknown. The living sloths are omnivores. They may eat insects, small lizards, and carrion, but their diet consists mostly of buds, tender shoots, and leaves. The three-toed sloths in particular feed almost exclusively on leaves. The two-toed sloths eat fruits, nuts, berries, bark, and occasionally small rodents. Beyond camouflage, sloths' claws serve as their only natural defense. A cornered sloth may swipe at its attackers in an effort to scare them away or wound them. Despite sloths' apparent defenselessness, predators do not pose special problems: Sloths blend in with the trees and, moving only slowly, do not attract attention. Only during their infrequent visits to ground level do they become particularly vulnerable. The main predators of sloths are the jaguar, the harpy eagle, and humans. The majority of sloth deaths in Costa Rica are due to contact with electrical line and poachers. Their claws also provide a further unexpected deterrent to human hunters—when hanging upside-down in a tree they are held in place by the claws themselves and often do not fall down even if shot from below. Pale-throated three-toed sloth (Bradypus tridactylus) in a Costa Rican rehabilitation center. Infant sloths normally cling to their mother's fur, but occasionally fall off. Sloths are very sturdily built and rarely die from a fall. In some cases, they die from a fall indirectly because the mothers prove unwilling to leave the safety of the trees to retrieve the young. Females normally bear one baby every year, but sometimes sloths' low level of movement actually keeps females from finding males for longer than one year. Despite their adaptation to living in trees, sloths make competent swimmers. The members of the two families of living sloths, Megalonychidae and Bradypodidae, have similar adaptations, but the actual relationships of the living sloth genera are more distant from each other than their outward similarity suggests. The two-toed sloths of today are far more closely related to one particular group of ground sloths than to the living three-toed sloths. Whether these ground-dwelling Megalonychidae were descended from tree-climbing ancestors or whether the two-toed sloths are really miniature ground sloths converted (or reverted) to arboreal life cannot presently be determined to satisfaction. The latter possibility seems slightly more likely, given the fact that the small ground sloths Acratocnus and Synocnus, which were also able to climb, are among the closer relatives of the two-toed sloths, and that these together were related to the huge ground sloths Megalonyx and Megalocnus. The evolutionary history of the three-toed sloths is not at all well-known. No particularly close relatives, ground-dwelling or not, have yet been identified. The ground sloths do not constitute a monophyletic group. Rather, they make up a number of lineages, and as far as is known until the Holocene, most sloths were in fact ground-dwellers. The famous Megatherium, for example, belonged to a lineage of ground sloths that was not very close to the living sloths and their ground-living relatives like the small Synocnus or the massive Megalonyx. Meanwhile, Mylodon, among the last ground sloths to disappear, was only very distantly related to either of these. Scelidotherium leptocephalum fossil. Muséum national d'histoire naturelle, Paris. Paramylodon harlani fossil, National Museum of Natural History, Washington, D.C.
Brown-throated three-toed sloth Dallas World Aquarium and Zoo, Dallas, TX. ↑ 1.0 1.1 A. Gardner, "Order Pilosa," Pages 200-103 in D. E. Wilson and D. M. Reeder, eds. Mammal Species of the World: A Taxonomic and Geographic Reference, 3rd edition. (Baltimore: Johns Hopkins University Press, 2005, ISBN 0801882214). BBC. 2008. Megatherium (Megatherium americanum). BBC Science and Nature. Retrieved October 15, 2008. Briggs, H. 2008. Sloth's lazy image "a myth." BBC News May 13, 2008. Retrieved October 15, 2008. Butler, R. A. 2007. Rainforest: The canopy. Mongabay. Retrieved October 15, 2008. Kissell, J. 2008. The hidden lives of sloths. Interesting Thing of the Day February 4, 2005. Retrieved October 15, 2008. Integrated Taxonomic Information System (ITIS). 2006. Folivora Delsuc, Catzeflis, Stanhope and Douzery, 2001. ITIS Taxonomic Serial No. : 727503. Retrieved October 15, 2008. Mason, B. 2005. Humans drove giant sloths to extinction. ScienceNOW August 1, 2005. Retrieved October 15, 2008. Mendel, F. C. 1979. The wrist joint of two-toed sloths: Its relevance to brachiating adaptations in the Hominoidea. Journal of Morphology 162: 413-424. — 1981a. Use of hands and feet of two-toed sloths (Choloepus hoffmanni) during climbing and terrestrial locomotion. Journal of Mammalogy 62: 413-421. — 1981b. The hand of two-toed sloths: Its anatomy and potential uses relative to size of support. Journal of Morphology 169(1): 1-19. — 1985a. Use of hands and feet of three-toed sloths (Bradypus variegatus) during climbing and terrestrial locomotion. Journal of Mammalogy 66: 359-366. — 1985b. Adaptations for suspensory behavior in the limbs of two-toed sloths. Pages 151-162 in G. G. Montgomery (ed. ), The Ecology and Evolution of Armadillos, Sloths and Vermilinguas. Washington, D.C.: Smithsonian Institution Press. Weignberg, I. 1999. Speed of a sloth. In G. Elert, The Physics Factbook. Retrieved October 15, 2008.